Two, Four, Six, Eight! Who Do We Appreciate? The correct answer to this grade school cheer is readily apparent for lovers and haters of this site: The Oregon Ducks. (I realize that the technically correct answer to this is probably Ohio State, but this site is not named FishBuckeyes). Of course, appreciation exists in a variety of degrees. Older Ducks fans remember the infamous Toilet Bowl, a veritable paean to gridiron ineptitude. Younger Ducks fans know only the excellence, and have come to believe that it is the only state in which the Ducks had existed, currently exist, and will exist. Both groups are grappling with last night’s dismantling at the hands of Urban Meyer’s Ohio State Ducks Buckeyes. Fans, young and old alike, I encourage you to think about one feeling: appreciation. I think of myself as falling somewhere in between the two groups. My love for sports manifest itself as a four year old reading the sports section of the Oregonian. My love for the Ducks started in 1989 as a 7 year old. That year, I had an inkling that playing in the Independence Bowl meant something, but I didn’t know quite what. Plus, I didn’t quite have the fan stamina as a kid to invest in both my first love, the Portland Trailblazers, and the Ducks. My first sports tears were spilt over losses to the Bad Boys and Jordan’s Bulls, not the Toilet Bowl. Over the course of the ’90s, amid myriad bowl appearances, I figured that the Ducks’ 1994 Rose Bowl represented the zenith of the University of Oregon’s football success. I believed that The Pick stood as the greatest single play in Oregon history. (It probably still does.) After all, Rich Brooks left to helm the St. Louis Rams, and took the innovator behind Gang Green’s success, Nick Aliotti. I was wrong. Belotti built on Brooks’ success, as Oregon reached even greater heights, culminating with the Fiesta Bowl win over the Colorado Buffs and their vaunted rushing attack, and a number two ranking in the BCS. I thought this was surely the acme of Oregon Football. By the wise old age of 22, the cynical sports fan in me figured that Oregon Football was beginning its slow decent into the morass of 7-6 teams. I was still smarting from the Blazers’ historic collapse against a Lakers team featuring Voldemort Kobe Bryant and the Big Aristotle. I was wrong. Belotti hired Chip Kelly, and the rest is recent history. Disappointment wrought by the Rose Bowl in 2009 (at the hands of this year’s College Football Champion of the Universe), and the BCS Championship in 2010 (thanks to Casey Matthews’ body and Michael Dyer’s hand) made me think we were a kinda-sorta-maybe contender. Ascendance to the Highly-Regarded Football Programs club was in sight. Wins in the Granddaddy of Them All and the Salsa Chip Bowl accompanied a sense of relief, that maybe, finally, hopefully, we would finally be granted our golden ticket to national respectability. Kelly leaves, taking Jerry Azzinaro with him. Aliotti retires. In came Mark Helfrich, Medford born and Coos Bay bred, becoming the latest navigator of the Ducks’ coaching cursus honorum. Rumors of Oregon’s demise are again imminent – Helfrich is too inexperienced; the WR corps is depleted; the recruiting is good, but not good enough. The Ducks’ heyday is probably behind them. I was wrong. Last night was the final stroke in refuting the idea that Puddles and Co. are doomed to be also-rans in the annals of college football history. Think about this quasi-biblical reformulation of the history of Oregon QBs: Bill Musgrave begat Danny O’Neil, who then begat Tony Graziani and Ryan Perry-Smith, who begat Akili Smith and A.J. Feeley, who begat Joey Heisman Harrington, who begat Jason Fife and Kellen Clemens, who begat Dennis Dixon, who begat Jeremiah Masoli, who begat Darron Thomas, who begat current Heisman Trophy winner, Marcus Mariota. This list represents the last 25 years of Oregon QBs. (I could do the same for other positions, but I am pretty certain that readers did not come for a recitation of the lineage of Oregon Ducks at each position.) With few exceptions, these players’ careers, as well as those of numerous other Ducks, have extended to the National Football League (Cris Carter voice). They stand as a testament to the quality of men and players that the Ducks produce. 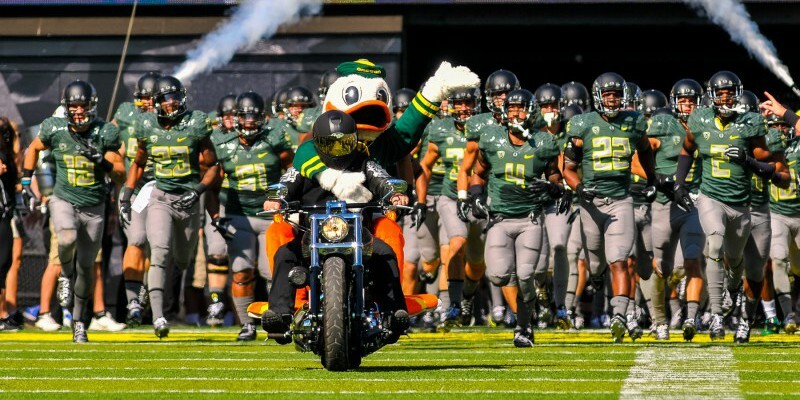 I have heard and read various talking heads extol the arrival of Oregon Football into the pantheon of great programs. I agree. As the saying goes, once is an anomaly, twice is a trend. Our second championship appearance is not the last that the world has heard of the Ducks, one of the two great football programs (Linfield and Oregon) that call the 9th largest state home. It is time not to wallow in the plucking suffered last night. The fate of Oregon football does not rest upon Marcus Mariota’s impending decision. It is time to marvel at the Ducks and their march from the Toilet Bowl to the College Football Final. It is time to appreciate the effort these young men give, as well as their physical sacrifices. We certainly do love to learn about our beloved Ducks. But now is the time to appreciate the Ducks. Neil Young said that rock n’ roll is here to stay. So are the Ducks.